The empty-nester couple had just moved into their dream retirement home and wanted to customize their master suite to accommodate both of their statures and to incorporate aging-in-place elements. They requested more efficient storage and a clean contemporary look. 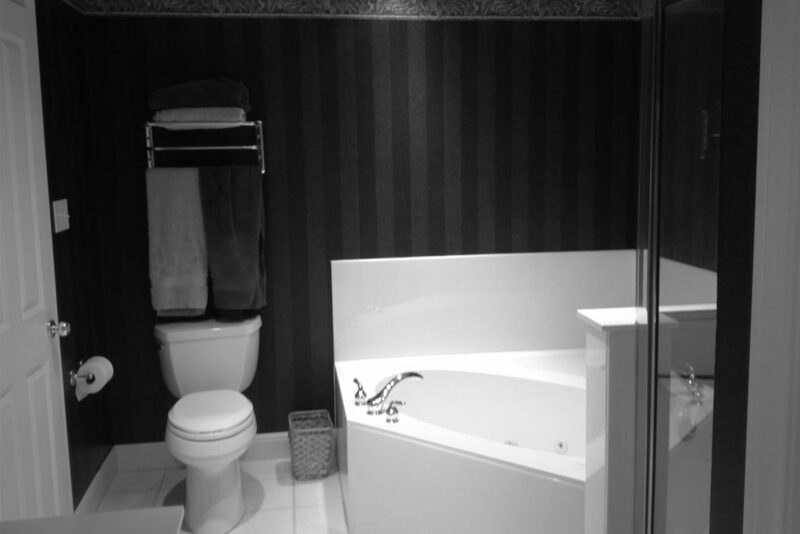 The original bath was very traditional in styling and didn’t function well as a two person master suite. One vanity was located in an open dressing area off the bedroom which disturbed the one spouses’ sleep while other practiced their normal routine. The couple also didn’t want a tub in the new plan and the existing large corner tub took up valuable real estate in the bathroom. A private toilet area, TV viewing from all angles in the bathroom, and a large shower were other priorities needing to be addressed. The first thing our team did was address the storage issue. 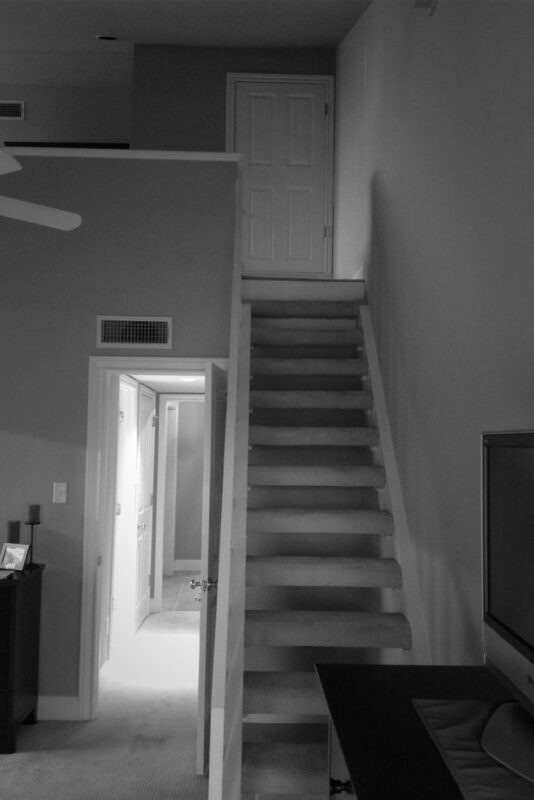 Needing to expand the width of the staircase in order to meet new codes anyway, this allowed us to take advantage of underutilized area beneath the stair case. We designed a unique pull out closet storage system under the stairs which made for comfortable access and easy visibility for shoes, purses, linens or miscellaneous items. We also removed the vanity sink in the dressing area to create additional storage. A generous stack of drawers and a tall cabinet provide the client with supplemental storage for folded items, hanging garments and adjustable shelves for extra linens. In the bathroom, we removed the tub and designed a roomy shower with a frameless glass enclosure to give the clients the modern aesthetic they desired. Using NKBA guidelines we set the thermostatic/pressure balance control within easy reach of the shower entry and installed grab bars throughout the space. A shower head on a slide bar allows for adjustability between the heights of the couple. Modern 12×24 and 1×1 mosaic format floor tiles with a high friction coefficient keeps the flooring safe and skid resistant while maintaining a clean, contemporary look. Moving the commode across the room and installing it in an enclosed room, complete with pocket door, ventilation fan and a grab bar, freed up space for a second vanity. 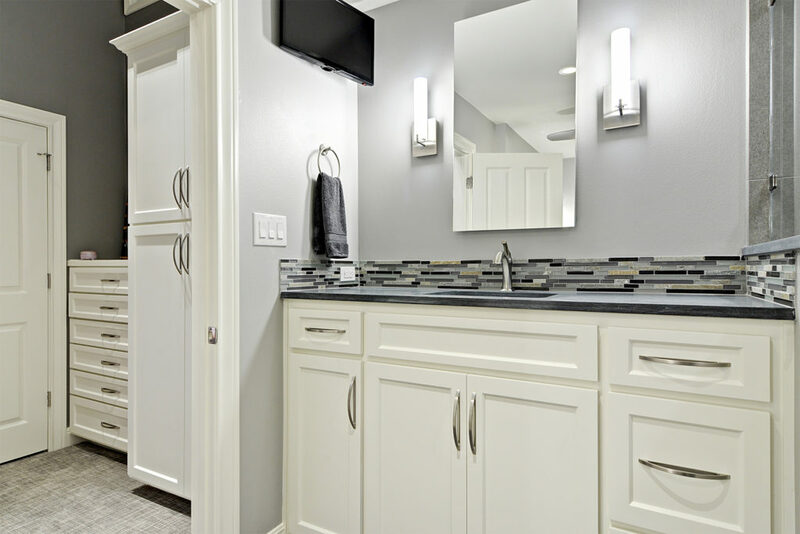 We adjusted the vanity height and lighting to accommodate for the husband, whom, at 6′ 4″ tall, needed a considerably higher vanity than the existing 32″ high cabinet. A sleek mirrored medicine cabinet by Robern provides an additional convenience outlet within the cabinet and a wall mounted TV on a retractable arm completes the “man’s” vanity. The wife’s vanity was customized as well by providing proper grooming lighting and a vanity height for her petite stature. Likewise, an electrical strip was installed within one of the drawers to accommodate her grooming appliances, with on off capability achieved when the drawer is opened and closed. Finally, roll-out drawers were installed in the door sections of the cabinetry to grant universal accessibility to its contents. We took illuminating the entire master suite into careful consideration. First we installed LED sconces at the vanities. 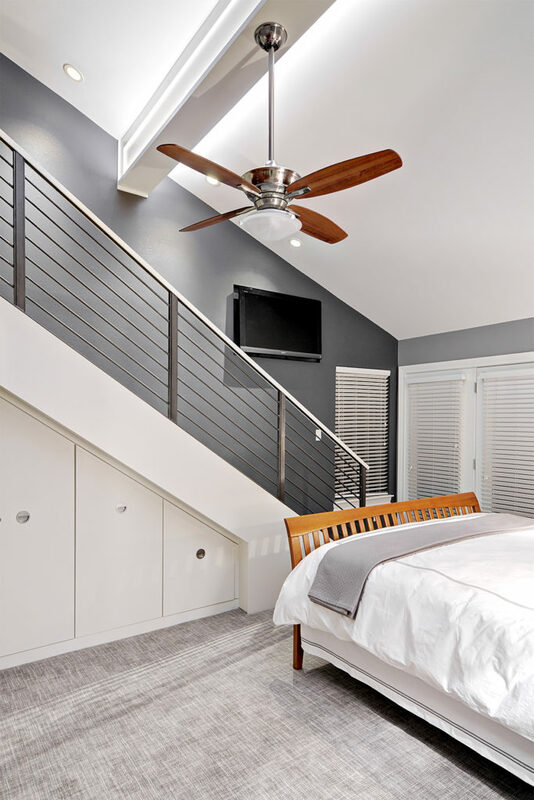 We also incorporated LED recessed cans to provide adequate ambient illumination without additional heat and then added a mini ceiling fan and upgraded the ventilation system to produce better air movement. In the master bedroom we overcame the issues with lighting the vaulted ceiling by installing LED strip lights on the existing beam creating indirect illumination. We then added a few adjustable LED gimbals along the stair case for accent lighting. Flexible arm reading lights and decorative lamps flank the bed to provide both task and accent lighting. Dimmer switches were incorporated on all the lighting to permit the clients ultimate flexibility in illuminating their space. Aesthetically, the space exudes a cool modern feel. Crisp grays flow in gradient values from smaller to larger spaces. A glass and natural stone linear tile accents the bathroom backsplashes and runs seamlessly through the shower enclosure providing a variety of texture and sheen. A smoky shade of peppercorn does double duty accentuating the stair case wall while camouflaging the recess for the TV in the master suite. The dark charcoal color provides the perfect canvas to showcase artwork in the future as well. Warm white cabinetry and trim work counteract the cool grays in order to keep the spaces from feeling too sterile. Furthermore, the contrast of the hard Pietra Cordosa limestone with its soft honed finish adds an interesting contradiction of texture and sheen while its stony hue compliments the overall color palette.